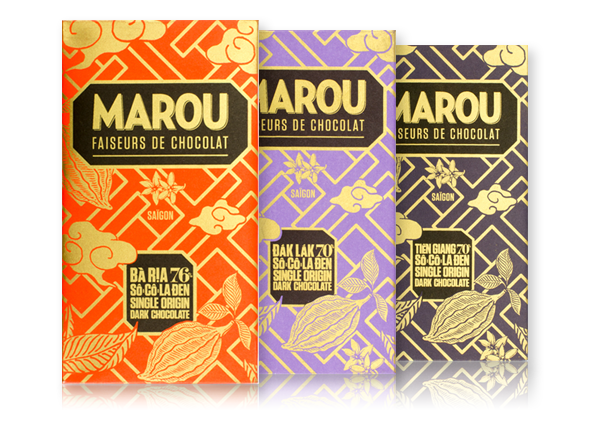 Marou are now supporting the efforts of small farmers in a number of Vietnamese provinces. The company are passionate about cacao and their hard work is making Vietnam one of the most exciting new producers of cacao in the world. Vietnamese chocolate is unlike any other. Made mostly from a bean called trinitario and the rarer, more nuanced criollo bean. Ba Ria 76% – this is a bold chocolate. The fruitiness is purely from the beans but tastes as if the juice of rich cherries has been mixed with chocolate. Dak Lak 70% – cocoa grown by farmers in the highlands of Vietnam. Full bodied chocolate with long spicy and earthy flavours as you taste. Tien Giang 70% – organically grown by farmers of the Cho Gao cooperative in the Mekong delta. A full bodied bar producing both spicy and fruity notes.